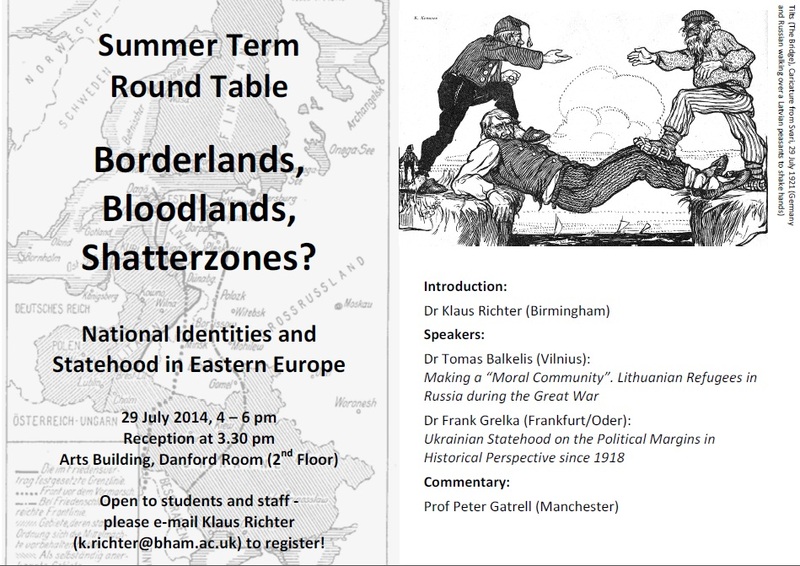 At the very end of this academic year, we will have a summer-term round table on national identities and statehood in Eastern Europe, with two highly original research papers by Dr Tomas Balkelis (Vilnius) and Dr Frank Grelka (Frankfurt/Oder) and a commentary by Prof Peter Gatrell (Manchester). Both case studies presented have a lot to say about a much larger region and the various factors shaping national identities and independent statehood, the long-term effects of which have become visible again with the recent events in Ukraine. Plus – the decisive role of the Great War for the development of nationalism will be highlighted, which should really be a reason for everyone to come. The round table is preceded by a reception at 3.30 pm in Danford Room. Presentations will begin at 4 pm, followed by discussion. Please register with Klaus Richter (k.richter@bham.ac.uk)!